Sure, his business is a little different than ours. He doesn’t work your typical nine to five shifts. He sure doesn’t do any heavy lifting or sitting behind a keyboard for hours. When you see him on the street you might get confused about what his job actually is. Or if he even has a job. . .but you're sure to be surprised! But the man in purple does, in fact, have a job. He has a pretty fly job, in fact, he's always working it! Who do you think keeps the underground disco scene going? The guy in purple does, duh. He owns a nightclub. A disco nightclub. They play Stayin' Alive, and I will Survive, followed by Super Freak. The girls all go crazy for a guy who knows how to move. And if there is one thing disco does, it moves. 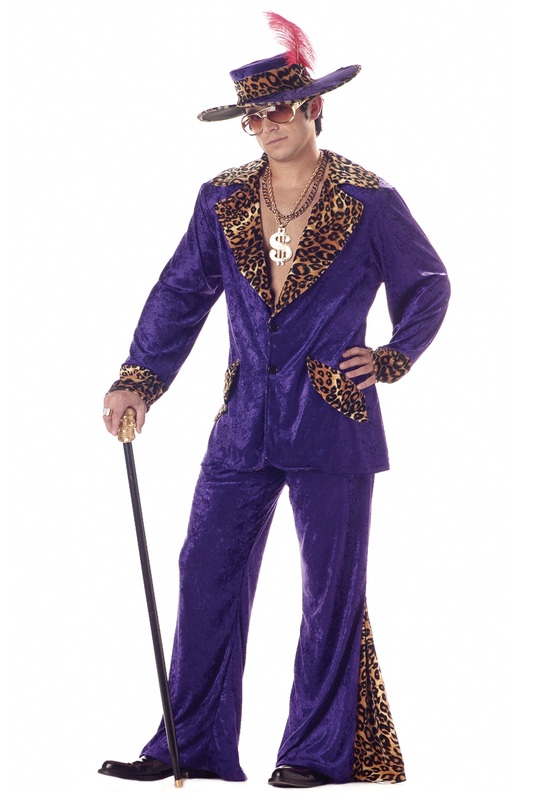 So if you are ready to show off your moves to That's the Way I Like it, grab this Purple Pimp Costume with its leopard print and velvet fabric! You will have all the coolest folks telling you how to fly you look in your gold chains and leopard print lapels. All those fuddy-duddy nine to fivers will be begging to get into your underground disco dance club. And that doesn’t even take into account the lovely people who will be looking to boogie with you out on the dance floor. We're sure they'll be dressed up too, in their flyest outfits and their sparkliest jewelry. All to get a disco dance with the Purple Disco Man! This costume is exactly as pictured. The fit is slightly smaller than I expected. Bought a large and the coat is a little snug but will still work.